Singing Palette - The world class platform connecting global collectors with contemporary artists! The Singing Palette’s website is a nonprofit International platform which collects and displays multi-language information of art. The funded party of the offline body includes several natural persons, trust funds, and Jiayi (Fine Arts) Limited Corporation (Hong Kong). Singing Palette displays your artworks in English, Chinese, French, and German to audiences over the world free of charge! Singing Palette presents your artworks to over one hundred collaborating galleries and media around the globe free of charge! Singing Palette—Art Collecting Consultation: Set up a trustful bridge for global collectors and artists! Singing Palette—Exhibition Service: Collaborate with global galleries and media to propel your art dreams further! Singing Palette - collects works selectively from art stars of tomorrow. We even sign a contract with them and hold global itinerant exhibitions for the artists together with our cooperative partners to promote the popularity and market value of the artists at most. Singing Palette - A professional and comprehensive art website edited by famous artists! Singing Palette is established on the base of providing open resources, which is a professional and 100% free communicational platform for international arts. 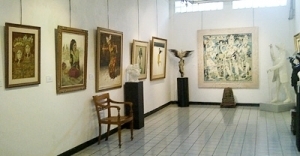 Artists and art lovers can obtain our services free of charge. Our editors include Singing Palette team, the global voluntary editors, noted Art Consultants and voluntary translators. Here, you will find that we have collected thousands of original artworks by professors, teachers, graduates from key and professional Academy of Fine Arts. Upholding the principles of compatibility, professionalism and contemporaneity, we have collected nearly one thousand works by over one hundred artists, late painters included. Lots of works by these artists, some of whom are new talents, are the choices by domestic renowned Auction Companies and collectors. Here, you will also find the original works submitted to Singing Palette art website by global artists. Some artists submit their works directly after registering Singing Palette, some are recommended by their contracted galleries. Singing Palette will verify, translate and publish their works to its corresponding English, Chinese, French and German websites, meanwhile, we will send the subscribed art E-news to global readers free of charge. Moreover, we will promote them to both markets home and abroad via Web Display, Exhibition Presentation, Email Subscription, Advertising Albums, Publishment and other necessary forms. Singing Palette will conduct market promotion for artists freely, with no commissions and charges at all. While helping the artists gain economic profits, global visitors can also submit the reviews and comments online after browsing these works, which will facilitate the dialogue between artists and the market. Meanwhile, artists can absorb these comments with open hearts to climb up to a brand-new peak of art creation.